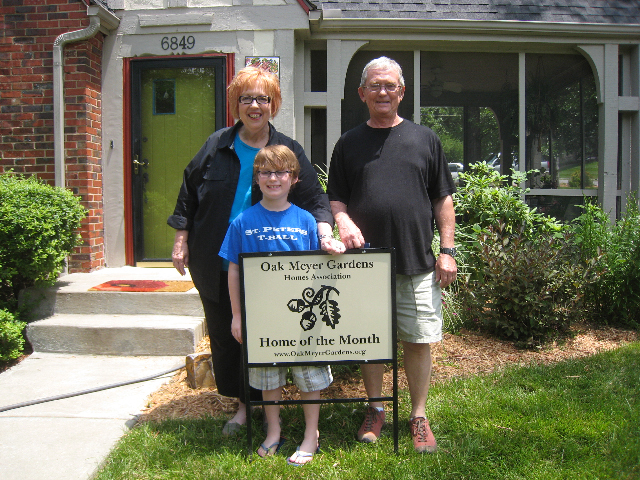 The Home of the Month award for June 2011 was presented to Bruce and Kathleen Mendenhall at 6849 Oak. The Home of the Month award is presented to Oak Meyer Gardens residents who take exceptional pride in the outward appearance of their home and property. Bruce and Kathleen have lived in their home for 37 years, and they give a lot of credit to their daughter, Amy, for helping design their home’s beautiful lawn and landscaping. In addition to being recognized for their efforts, Bruce and Kathleen were presented with a $25 gift card donated by our award sponsor, Euston’s Waldo Hardware, located at 126 W. 75th St.
That’s a beautiful yard – I have admired the home and landscaping on my walks with Charlie, my boxer dog. Congrats, neighbors!